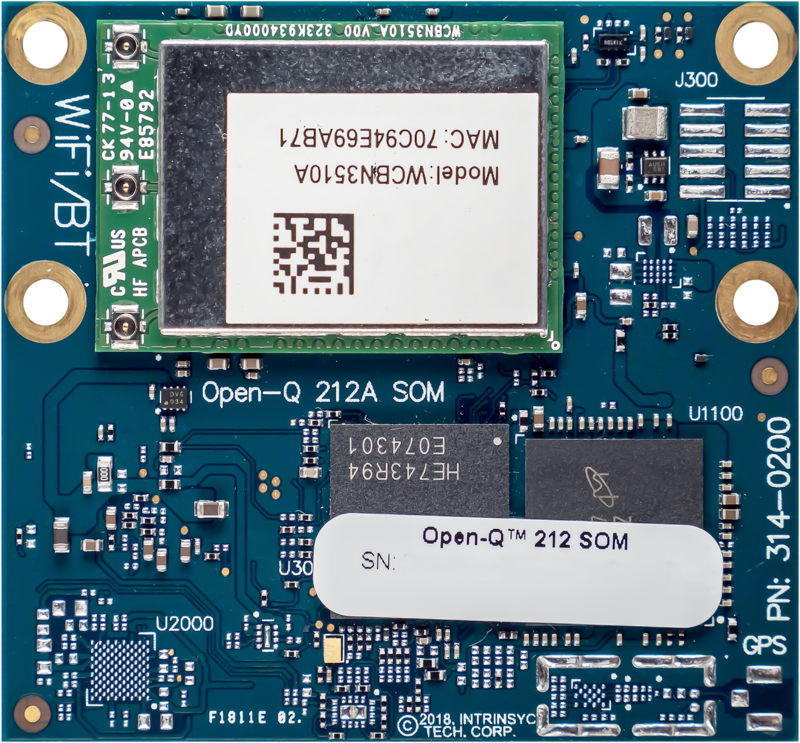 Android Things is Google's managed OS that enables you to build and maintain Internet of Things devices at scale. We provide a robust platform that does the heavy lifting with certified hardware, rich developer APIs, and secure managed software updates using Google's back-end infrastructure, so you can focus on building your product. 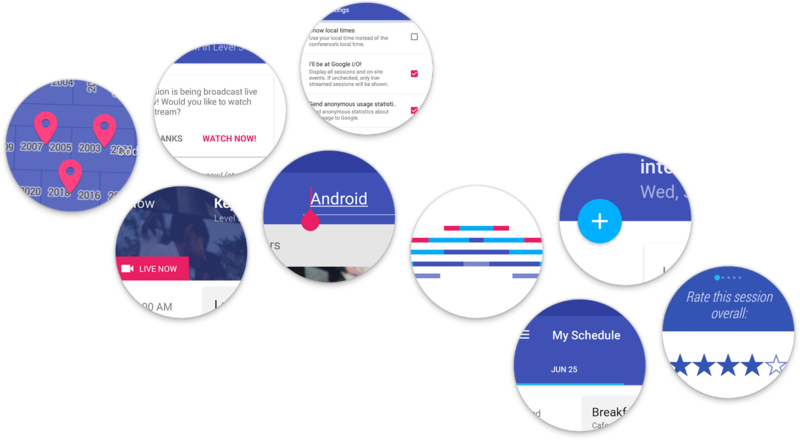 After a developer preview with over 100,000 SDK downloads, we're releasing Android Things 1.0 to developers today with long-term support for production devices. 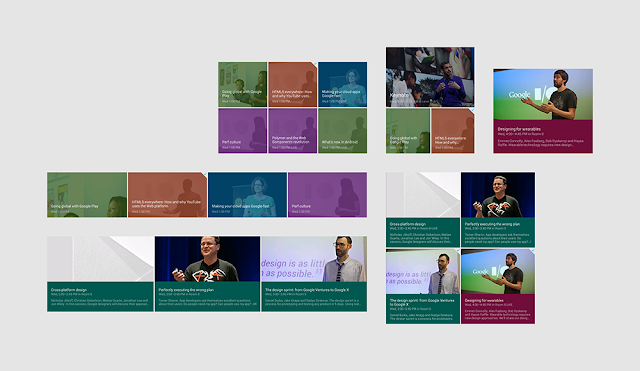 Developer feedback and engagement has been critical in our journey towards 1.0, and we are grateful to the over 10,000 developers who have provided us feedback through the issue tracker, at workshop events, and through our Google+ community. Today, we are announcing support for new System-on-Modules (SoMs) based on the NXP i.MX8M, Qualcomm SDA212, Qualcomm SDA624, and MediaTek MT8516 hardware platforms. 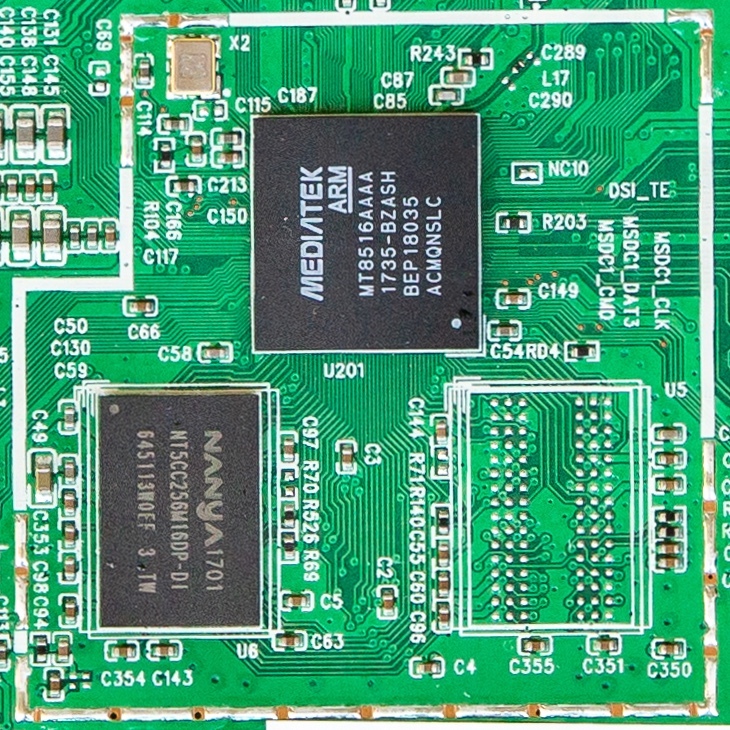 These modules are certified for production use with guaranteed long-term support for three years, making it easier to bring prototypes to market. Development hardware and reference designs for these SoMs will be available in the coming months. The Raspberry Pi 3 Model B and NXP i.MX7D devices will continue to be supported as developer hardware for you to prototype and test your product ideas. 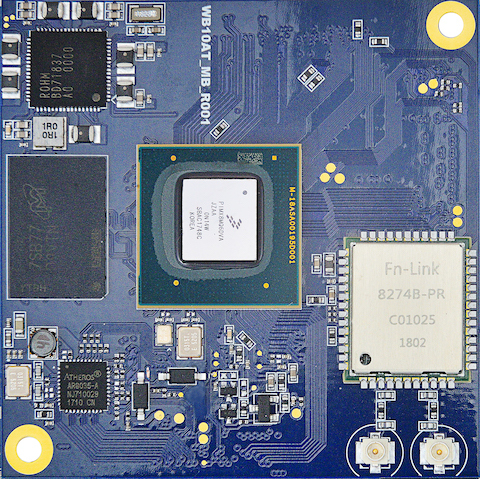 Support for the NXP i.MX6UL devices will not continue. See the updated supported platforms page for more details on the differences between production and prototype hardware. One of the core tenets of Android Things is powering devices that remain secure over time. Providing timely software updates over-the-air (OTA) is a fundamental part of that. Stability fixes and security patches are supported on production hardware platforms, and automatic updates are enabled for all devices by default. For each long-term support version, Google will offer free stability fixes and security patches for three years, with additional options for extended support. 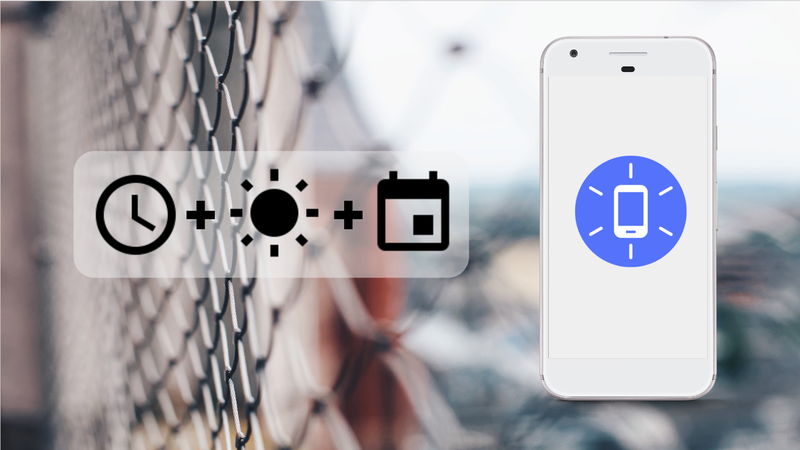 Even after the official support window ends, you will still be able to continue to push app updates to your devices. See the program policies for more details on software update support. Use of the Android Things Console for software updates is limited to 100 active devices for non-commercial use. 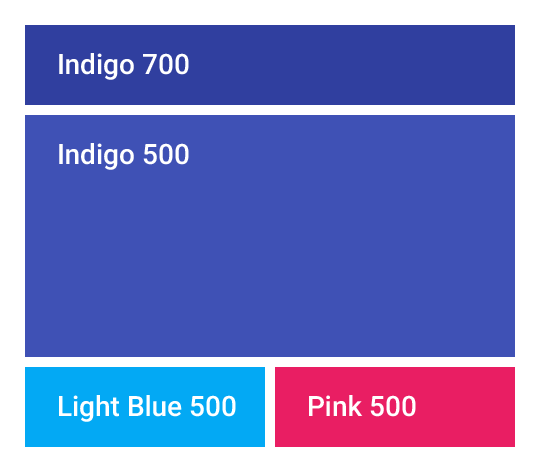 Developers who intend to ship a commercial product running Android Things must sign a distribution agreement with Google to remove the device limit. Review the updated terms in the Android Things SDK License Agreement and Console Terms of Service. The Android Things Console includes a new interface to configure hardware peripherals, enabling build-time control of the Peripheral I/O connections available and device properties such as GPIO resistors and I2C bus speed. This feature will continue to be expanded in future releases to encompass more peripheral hardware configurations. Over the past several months, we've worked closely with partners to bring products built on Android Things to market. These include Smart Speakers from LG and iHome and Smart Displays from Lenovo, LG, and JBL, which showcase powerful capabilities like Google Assistant and Google Cast. These products are hitting shelves between now and the end of summer. If you're building a new product powered by Android Things, we want to work with you too! We are introducing a special limited program to partner with the Android Things team for technical guidance and support building your product. Space is limited and we can't accept everyone. If your company is interested in learning more, please let us know here. Take a look at the full release notes for Android Things 1.0, and head over to the Android Things Console to begin validating your devices for production with the 1.0 system image. Visit the developer site to learn more about the platform and explore androidthings.withgoogle.com to get started with kits, sample code, and community projects. 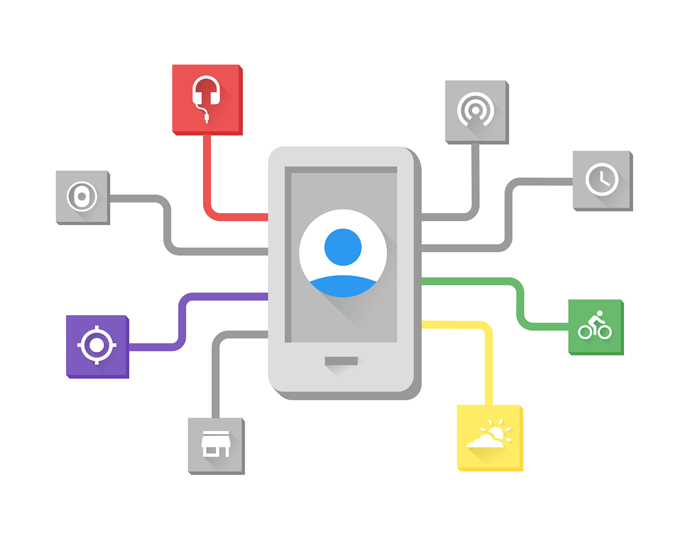 Finally, join Google's IoT Developers Community on Google+ to let us know what you're building with Android Things! Today we're releasing the source code for the official Google I/O 2017 for Android app. This year's app substantially modifies existing functionality and adds several new features. It also expands the tech stack to use Firebase. 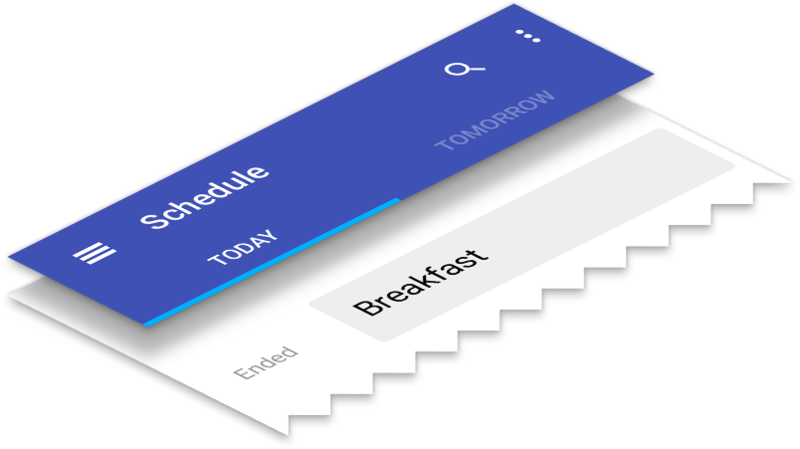 In this post, we'll highlight several notable changes to the app as well as their design considerations. The most prominent new feature for 2017 is the event reservation system, designed to help save in-person attendees' time and provide a streamlined conference experience. Registered attendees could reserve sessions and join waitlists prior to and during the conference; a reservation provided expedited entry to sessions without having to wait in long lines. Reservation data was synced with attendees' conference badges, allowing event staff to verify reservations using NFC-enabled phones. Not only was the reservation feature incredibly popular, but the reservation data helped event staff change the size of session rooms both before and during I/O to adjust for actual demand for seats. The reservation feature was implemented using Firebase Realtime Database (RTDB) and Cloud Functions for Firebase. RTDB provided easy sync across user devices — we just had to implement a listener in our code to receive database updates. RTDB also provided out-of-the-box offline support, allowing conference data to be available even in the face of intermittent network connectivity while traveling. A Cloud Function processed reservation requests in the background for the user, using transactions to ensure correctness of state (preventing mischievous users from grabbing too many seats!) and communicating with the event badging system. As in previous years, we used a ContentProvider as an abstraction layer over all app data, which meant we had to figure out how to integrate RTDB data with the ContentProvider. We needed to negotiate between having two local caches for data: 1) the extant local SQLite database accessed via the ContentProvider, and 2) the local cache created by RTDB to facilitate offline access. We decided to integrate all app data under the ContentProvider: whenever reservation data for the user changed in RTDB, we updated the ContentProvider, making it the single source of truth for app data at all times. This meant that we needed to keep open connections to RTDB only on a single screen, the Session Detail Activity, where users might be actively managing their reservations. Reservation data displayed in other parts of the app was backed by the ContentProvider. In offline mode, or in case of a flaky or delayed connection to RTDB, we could just get the last known state of the user's reservations from the ContentProvider. We also had to figure out good patterns for integrating RTDB into the overall sync logic of IOSched, especially since RTDB comes with a very different sync model than the ping-and-fetch approach we were using in the app. 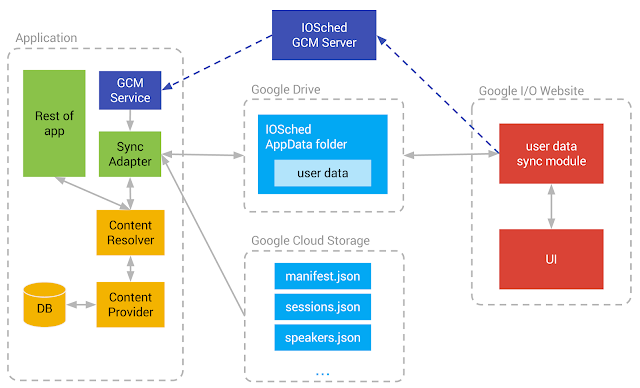 We decided to continue using Cloud Endpoints to synchronize user data across devices and with the web and iOS clients (the data itself was stored in Datastore). 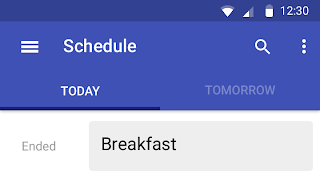 While RTDB provides out-of-the-box data syncing, we wanted to make sure that a user's reservation data was current across all devices, even when the app was not in the foreground. 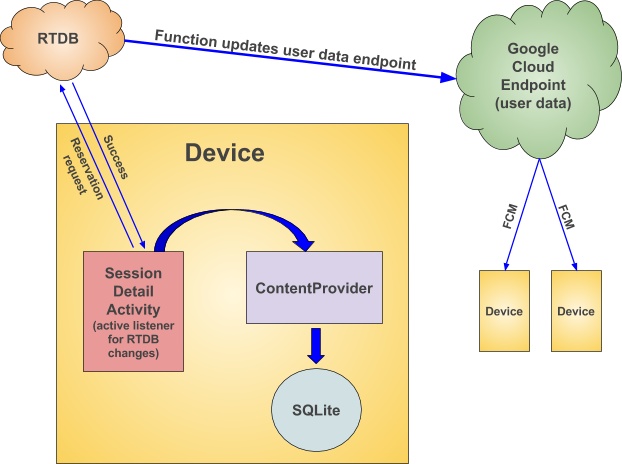 We used a Cloud Function to integrate RTDB reservation data into the sync flow: once reservation data for a user changed in RTDB, the function updated the endpoint, which triggered a Firebase Cloud Messaging downstream message to all the user's devices, which then scheduled data syncs. 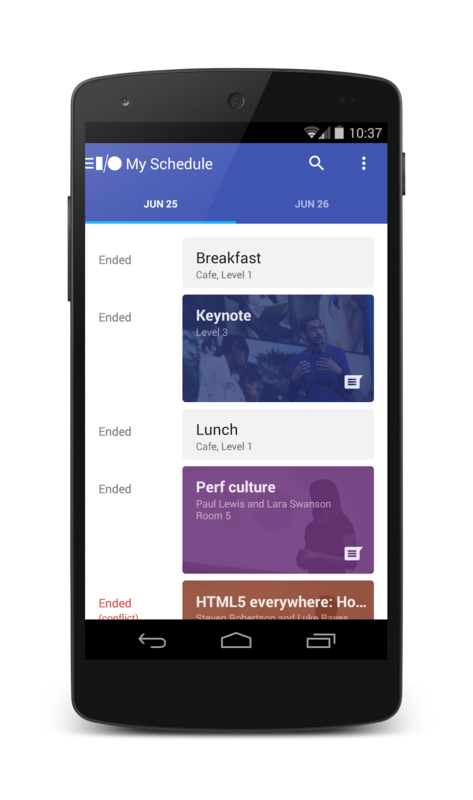 This year's app also featured a Feed to apprise users about hour-by-hour developments at I/O (most of the app's users were remote, and the Feed was a window into the conference for them). The Feed was also powered by RTDB, with data pushed to the server using a simple CMS. We used a Cloud Function to monitor RTDB feed data; when feed data was updated on the server, the Function sent a Cloud Messaging downstream message to clients, which visually surfaced the presence of new feed items to the user. In 2015 and 2016, we had adopted an MVP architecture for IOSched, and we continued using that this year. This architecture provides us with good separation of concerns, facilitates testing, and in general makes our code cleaner and easier to maintain. 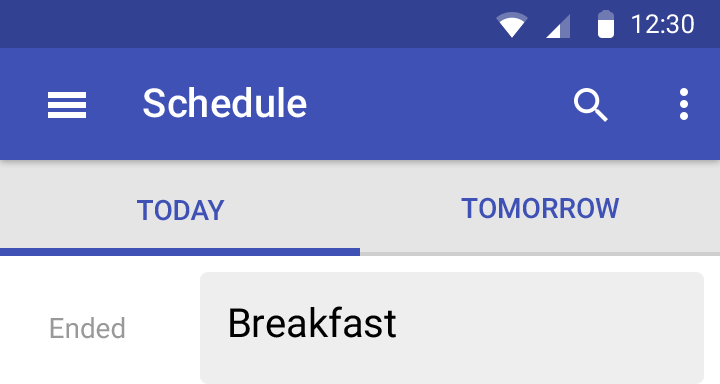 For the Feed feature, we decided to experiment with a more lightweight MVP implementation inspired by Android Architecture Blueprints, which provided the necessary modularity while being very easy to conceptualize. The goal here was both pedagogical and practical: we wanted to showcase an alternate MVP pattern for developers; we also wanted to showcase an architecture that was an appropriate fit for our needs for this feature. 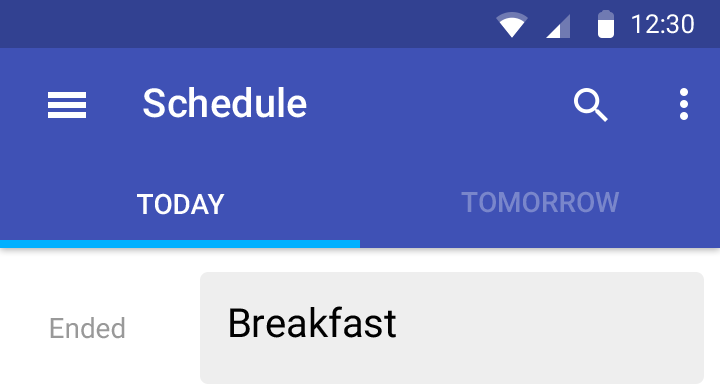 For the first time, IOSched made heavy use of Firebase Remote Config. In the past, we had found ourselves unable to inform users when non-session data - wifi information, shuttle schedule, discount codes for ridesharing, etc. - changed just before or during the conference. Forcing an app update was not feasible; we just wanted in-app default values to be updatable. Using remote config easily solved this problem for us. Conference data and user data changes were communicated via Cloud Messaging and data syncs (ping and fetch model). Feed data changes were controlled via RTDB. Changes to in-app constants were controlled via Remote Config. Even though we're releasing the 2017 code, we still have work ahead of us for the coming months. 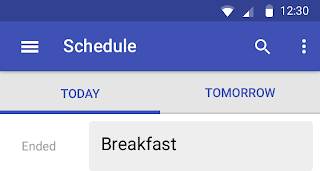 We'll be updating the code to follow modern patterns for background processing (and making our app "O" compliant), and in the future we'll be adopting Android's Architecture Components to simplify the overall design of the app. Developers can follow changes to the code on GitHub. Thousands of apps and millions of stores accept Android Pay, a simpler and more secure mobile payment experience. Android Pay is now available in 10 markets, with more coming soon, including Brazil, Canada, Russia, Spain and Taiwan. And in addition to our already announced Visa and Mastercard partnerships, we'll soon enable a streamlined mobile checkout experience for PayPal users. Yesterday, we announced the Google Payment API, which lets people pay in app or online with any verified credit or debit card saved to their Google Account, via products like Google Play, Chrome and YouTube. 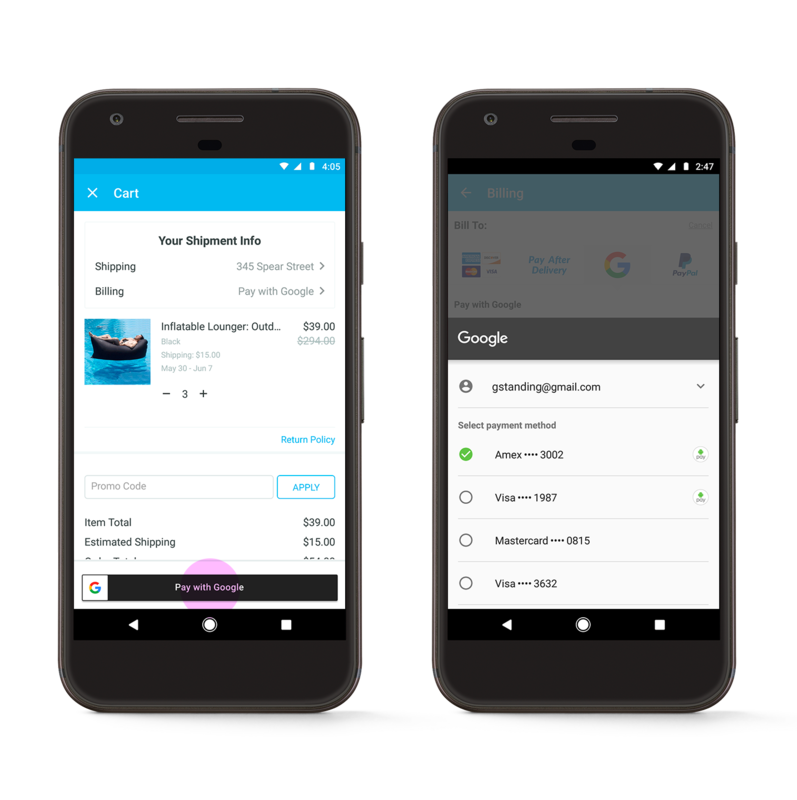 For users, the option to pay with Google means breezing through checkout without needing to remember and type multiple lines of payment details. You simply choose your preferred card, enter a security code or authenticate with your Android device, and check out. Developers who adopt this API can enable an easy-to-use checkout experience for their customers. 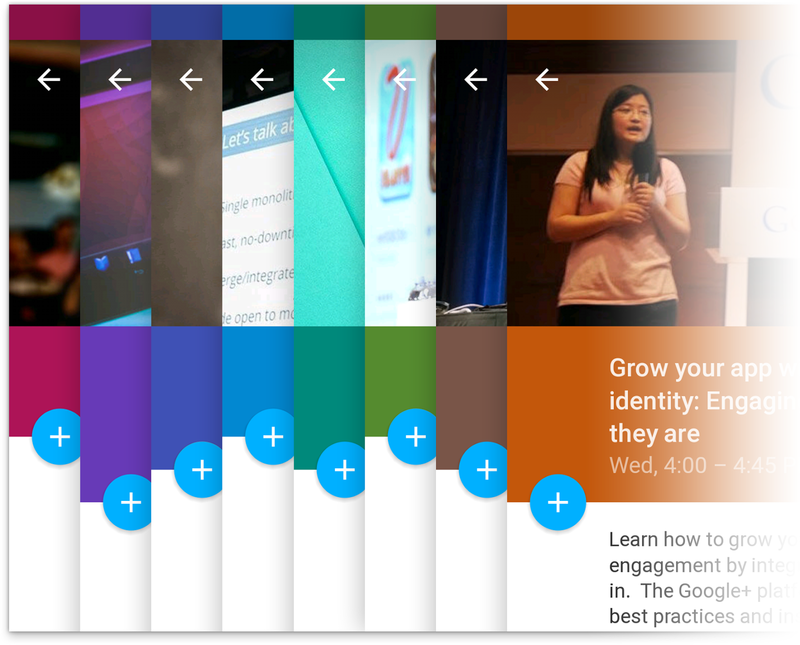 Sign up for early access to the new Google Payment API. 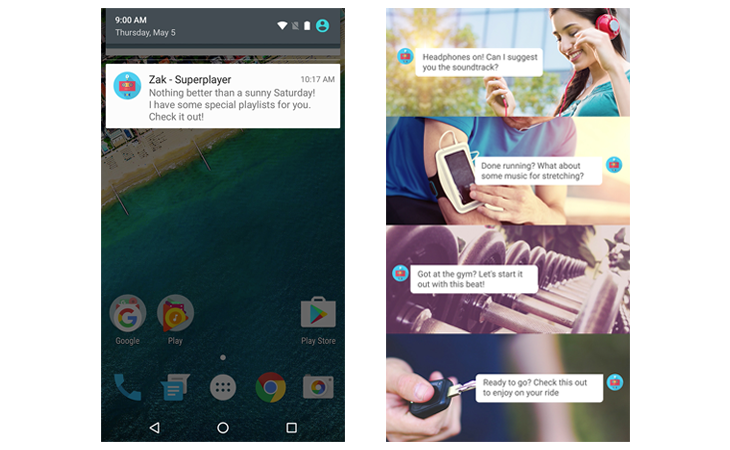 In the upcoming months, we'll also enable people in the U.S. to send or receive payments via the Google Assistant. On your Google Home or Android device, it's as simple as saying "Ok Google, send $10 to Jane for pizza." All you need is a debit card linked to your Google account. We're also announcing new ways for merchants to engage and reward customers before they walk into the store and after they've left. The Card Linked Offers API drives customer loyalty by providing a new channel to deliver targeted offers, and Panera Bread is one of the first merchants who will roll out this new capability nationally. 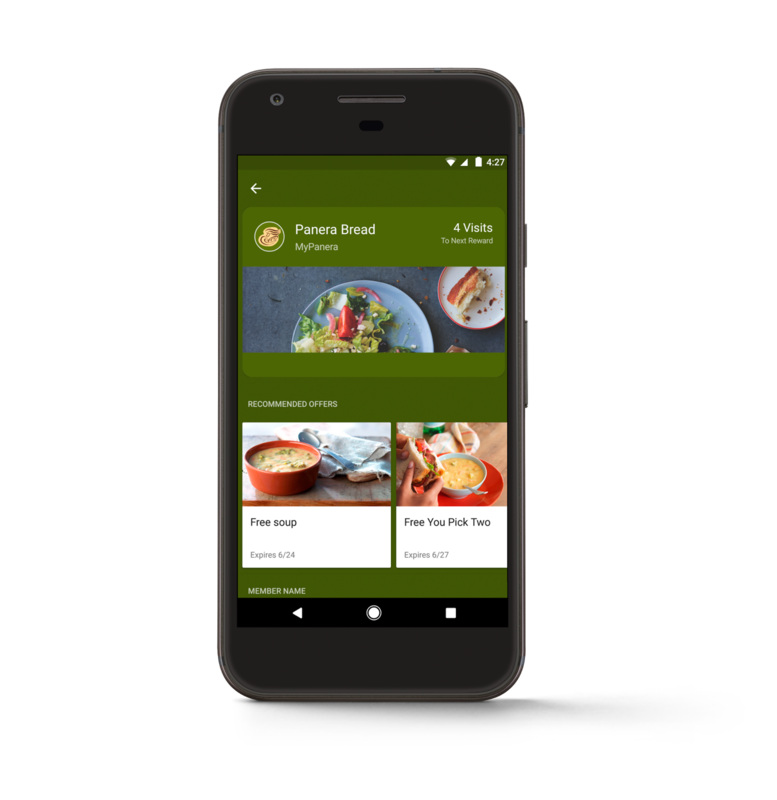 MyPanera members who save their loyalty card to Android Pay can discover offers and learn about new menu items, surfaced by Android Pay when they are at the store. The offer is redeemed when you use your MyPanera account at checkout. We're also making it easier for Android Pay users to add loyalty programs. For example, Walgreens Balance Rewards® members who manually apply their loyalty account with a phone number and use Android Pay will receive a notification on their phone that easily enables them to link that loyalty card to Android Pay for future visits. This experience is powered by our smart tap technology, which Walgreens has fully deployed across their 8,000+ U.S. stores. There's more—we're collaborating with Clover, a First Data company, to expand our smart tap technology beyond national retailers to businesses of all sizes. With the upcoming integration of smart tap in Clover's developer APIs, you'll be able to build Android apps for loyalty, coupon and gift card redemption and new features, such as order ahead and tap for pick up. 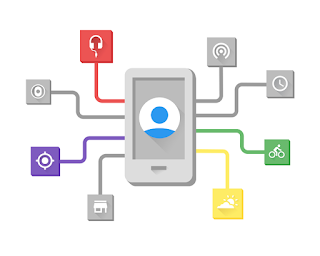 Visit developers.google.com/payments for the latest on all of our Google Payment, Loyalty and Offers APIs. We released a new backward-compatible Action Bar implementation called ActionBarCompat that's part of the Support Library r18. 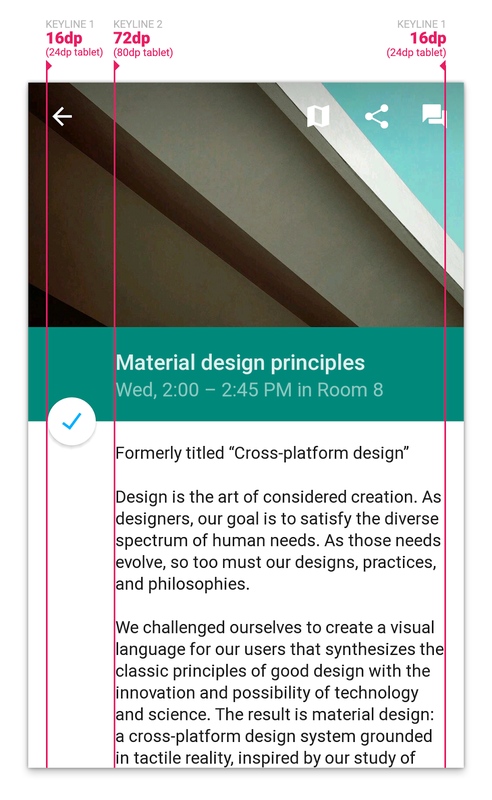 The ActionBarCompat APIs let you build the essential Action Bar design pattern into your app, with broad compatibility back to Android 2.1. This post helps you get started with ActionBarCompat, from setting up the Support Library to adding an Action Bar to your UI. 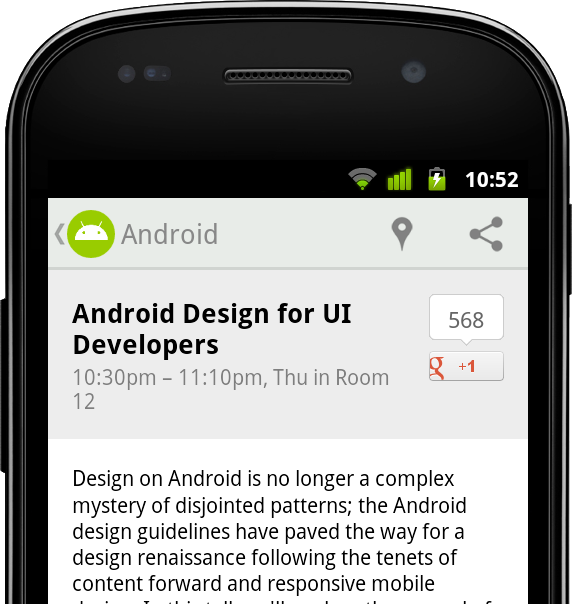 If you want to see ActionBarCompat in action first, download the I/O 2013 app from Google Play and give it a try. The app's Action Bar is built using the ActionBarCompat and served as our main test environment for making sure the APIs work properly, with full compatibility across platform versions. ActionBarCompat is a new API in the Android Support Library that allows you to add an Action Bar to applications targeting minSdkVersion 7 or greater. The API and integration have been designed to closely mirror the existing framework APIs, giving you an easy migration path for your existing apps. Can be kept updated as the Action Bar API evolves. Use of framework Menu and MenuItem classes. Continue to use the Support Library's Fragment class. Integrated support for ActionBarDrawerToggle for use with DrawerLayout. ActionBarSherlock is a solid and well-tested library which has served developers very well for a long time. If you are already using it and do not currently require any of the above then there is no need to migrate. If you are ready to get started with ActionBarCompat, the sections below take you through the process. ActionBarCompat is distributed as both a Gradle artifact and a library project. See Setting Up the Support Library for more information. Things get more tricky when you have a customized theme. The first thing to do is change your base theme to one of the Theme.AppCompat themes, like above. If you have customized styles for the Action Bar (and related widgets) then you must also change these styles to extend from the Widget.AppCompat version. You also need to double-set each attribute: once in the Android namespace and again with no namespace (the default namespace). 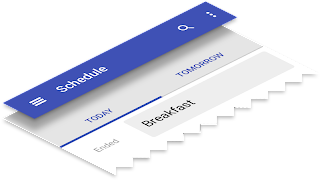 For example, in the following example we have a custom theme which extends from Theme.Holo.Light, which references a custom Action Bar style. To make this work with AppCompat you would move the above styles into the values-v14 folder, modifying each style's parent to be an AppCompat version. 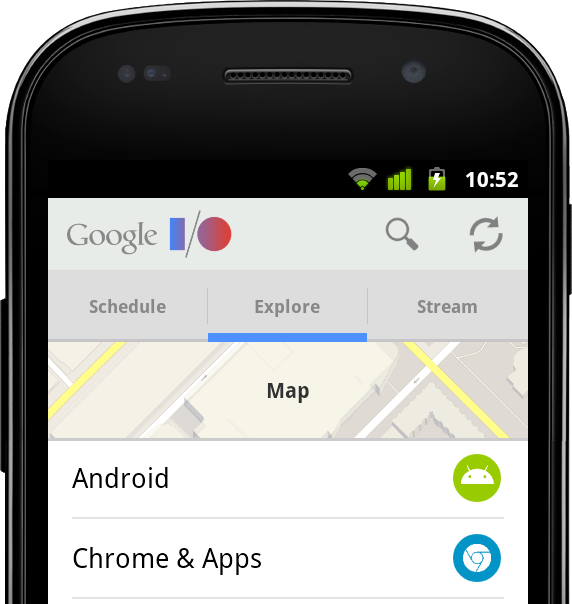 As with the standard Action Bar in Android 3.0 and later versions, action items are added via the options menu. The difference with ActionBarCompat is that you need to modify your Menu resource files so that any action item attributes come from ActionBarCompat's XML namespace. In the example below you can see that a new "yourapp" namespace has been added to the menu element, with the showAsAction and actionProviderClass attributes being provided from this namespace. You should also do this for the other action item attributes (actionLayout and actionViewClass) if you use them. ActionBarCompat contains one Activity class which all of your Activity classes should extend: ActionBarActivity. This class itself extends from FragmentActivity so you can continue to use Fragments in your application. There is not a ActionBarCompat Fragment class that you need to extend, so you should continue using android.support.v4.Fragment as the base class for your Fragments. ActionBarCompat contains it’s own ActionBar class, and to retrieve the Action Bar attached to your activity you call getSupportActionBar(). The API exposed by the compatibility class mirrors that of the framework ActionBar class, allowing you to alter the navigation, show/hide it, and change how it display it’s contents. // As we do not need to modify the menu before displayed, we return false. Similar to the Activity class, ActionBarActivity provides two methods that you can override to be notified when an action mode is started/finished from within your Activity (including attached Fragments). The methods are onSupportActionModeStarted() and onSupportActionModeFinished(). 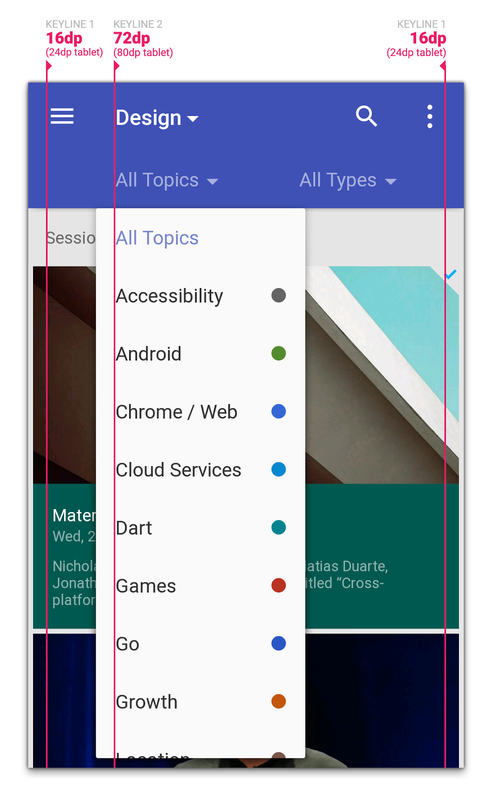 Up navigation support is built into ActionBarCompat and is similar to that provided in the Android framework in Android 4.1 and higher. 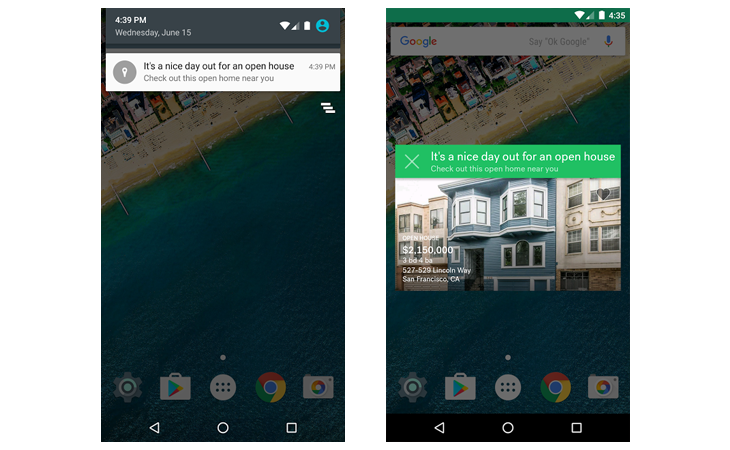 When the user now clicks on the home item, the user will navigate up to the parent Activity set in your AndroidManifest. The Action Bar API Guide covers a lot of what is in this post and much more. Even if you have used the Action Bar API in the past, it’s definitely worth reading to see how ActionBarCompat differs from the framework. There are also a number of sample applications using ActionBarCompat covering how to use the library in various ways. You can find them in the “Samples for SDK” package in the SDK Manager. Check out the video below for a quick hands-on with ActionBarCompat.